At CSG’s well-attended 2014 EMEA Customer Event in Greece yesterday and today, CSG representatives discussed the value and ability of the CSG portfolio to support IoT. CSG focused on its unique specializations in managing and monetizing data. Monica Ricci, Executive Director Product Marketing, presented on the topic and the CSG thought-leadership story. According to CSG definitions, IoT is based on sensors with transmit/receive capabilities embedded in anything. These sensors are being cost-effectively monitored and managed and provide valuable data that can be analyzed and acted upon. The IoT is the basis of our hyper-connected world. Shifts in world growth are causing developed-world enterprises to become faster, more agile, more cost-centric and more innovative. They must be better at all things. As John Chambers, CEO of Cisco has said, enterprises are living in an “and” world not an “or” world. Enterprises must do multiple things well all at the same time. These shifts in growth incent enterprises to come-up with new uses of technology to lower costs, increase efficiency and increase innovation — all end-goals of IoT solutions. Shifts in consumer attitudes and behaviors have made applications and data proliferation common-place. While we all value privacy, consumers are becoming more comfortable with some of their personal data and information about their activities being publicly available. Sharing data and using applications has made it more normal to even consider a world where billions of devices are contributing to that massive data pool. Major technologies are merging and this fortuitous confluence of technologies — analytics, cloud, horizontal platforms, edge computing, power management and hybrid communications — provides a fertile ground for IoT. According to MachNation, IoT will grow from 1 to 24 billion connected IoT devices by 2024. With approximately 33% CAGR worldwide and USD2.7 trillion in total IoT revenue we anticipate very fast growth rates in emerging markets and large number of devices in the developed world. IoT will touch almost all sectors including various industrial sectors, healthcare, energy utilities, security/surveillance, automotive/transport, public sector/connected cities, retail and finance. Interestingly, CSPs have chosen one of two roles for themselves in this burgeoning IoT ecosystem. Let’s look at them. Communications-plus — Many CSPs offer a fairly tight suite of connectivity and a fairly simple connectivity management platform. Revenue and cost opportunities are constrained, but for some CSPs there is more internal acceptance of standing-up a more limited offering. Solution provider — Other CSPs have chosen to stand-up more significant IoT business units and offer connectivity, connectivity management, hardware/devices, application platforms, applications and systems integration. CSPs choosing to become IoT solution providers, while not offering a full end-to-end offering for all IoT applications, have certainly chosen a more aggressive approach to offering digital services in IoT. Three are three key areas that must be operationalized when CSPs move from being simple IoT communications providers to providing a more complex solution. In particular, CSPs must operationalize people, process and data. CSPs have built IoT business units with 40-300 people to handle these new connected device opportunities. In general the ratio of sales-to-marketing-to-operations staff in these IoT business units is 1-to-1-to-1 (1:1:1). There are myriad processes that CSPs must operationalize when becoming IoT providers. These processes touch all aspects of front-office and back-office systems. They impact partnership management and integrations. They impact R&D, new product development, sales and support. CSPs need to operationalize data in two primary areas: management and monetization. Managing IoT data requires careful extraction, filtering, aggregation and correlation of data. IoT solutions involve so many partners that having flexible and strong OSS systems is absolutely critical. Data will come-in from multiple sources — IoT sensors, 3rd-party partners and legacy enterprise data — so having the tools to mediate, filter and aggregate these data are key. 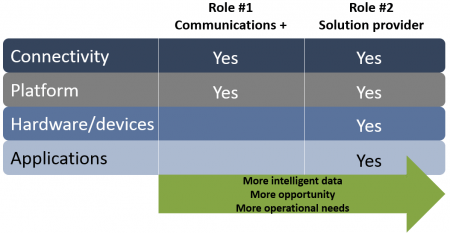 CSPs need to operationalize the way they monetize data in IoT. CSPs require systems to analyze, rate, charge and settle accounts. CSPs need systems capable of rating and charging appropriately for the various parties that require the data. These systems must be able to handle complex roaming requirements, as many IoT devices – for example those in the automotive, transport, logistics, fleet management sectors – can roam. Revenue sharing and more general partnership management is a key aspect of IoT. Systems must also handle enterprise-like requirements with large hierarchies and complex rating algorithms. Underpinning all these requirements is a CSP’s need to scale, secure and automate their IoT systems. MachNation has long held concerns that many of the systems adopted by CSPs to support these nascent IoT businesses won’t scale to high volumes. If this is the case, CSPs will find themselves in 2-4 years migrating all their IoT data, rating, policy and other systems to new systems. CSPs should be adopting scalable, secure, automated OSS/BSS from credible vendors that have the longevity, financial assets, internal capabilities and R&D resources to survive and help drive growth in IoT. CSG’s thought-leadership in IoT was insightful. We look forward to more indications of their directions and thoughts, particularly on the impacts of IoT on online mediation and policy management — two areas we believe haven’t received enough attention from CSPs.